There’s not a ton of fast food that, in my opinion, tastes halfway decent, but on occasion I used to enjoy Chick-fil-A. So, when I came across this recipe, I think it went on the menu that same week. We’ve already had this at least twice, the second time, we tried marinating the chicken in pickle juice as I had read somewhere that it was supposedly the “secret”, but honestly we both thought it was a bit too salty and prefer it without. This would also be a great option for kids as they are baked, not fried, and chicken fingers/nuggets/etc., always seem to be a crowd pleaser! Preheat oven to 425 degrees. Line a sheet pan with aluminum foil. On top of the tray, put a cooling rack and spray the rack with non-stick spray. Place the olive oil in a shallow dish. In a separate shallow dish, combine Panko breadcrumbs, regular breadcrumbs, salt, pepper, and powdered sugar together. Toss the chicken in the olive oil then dredge the pieces in the breadcrumb mixture, making sure each piece is coated evenly. 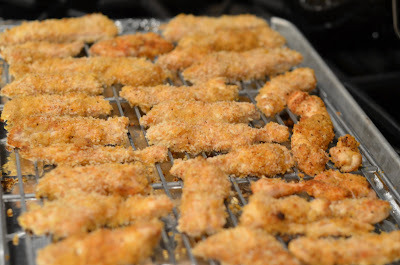 Place the nuggets on the cooling rack and spray the tops lightly with non-stick spray. Bake for 12-15 minutes, until golden brown.